Councillor McMahon Rips Off Taxi Cab Drivers! Someone with apparent City Hall experience and competence once told me this about our City Councillors: “Some of them have their hands out (for money) and some of them don’t. Most are in the middle. They all have at least one or two issues they really care about. But all of them really do care about one thing: their own political futures.” The Grand Finale of many years of City of Toronto use and abuse of its taxi industry was meant to happen when, on February 19 last, Ward 32 Councillor Mary Margaret McMahon rose in the Council Chamber and, after a few vacuous sentences about dealing with this taxi matter being “the right thing to do,” she proposed the passage of a set of taxi recommendations that she may or may not understand are meant to first bankrupt most of the industry so that the City can take back the equity taxi plates – which are legal assets that the City itself once induced mere taxi drivers to structure many years of their working lives around earning. McMahon’s motion passed by a margin of 31-12. In the news reports of her action, she was self-congratulating quoted as having extensively “schmoozed” and lobbied other members of Council to support her motion. Ms. McMahon is a member of City Council’s Licensing and Standards (L&S) Committee and she sits on Council as an advocate of Green Party principles. I’d guess, too, she knows the front of a cab from the back and that the real purpose of these taxi changes is lots more money for the City in an incipient taxi industry new order. After that, she probably knew that passing the recommendations would end the long line of begging taxi people who were taking up her valuable green time over something she doesn’t understand anyway. So what if taxi people lose the fruits of their life’s work! So what if thousands of taxi drivers have to work for nothing over a period of years! So what if the City of Toronto welshes on its word! Green is green! Because that’s the way it is: most, not all, of the Councillors don’t understand, or care to understand, the taxi industry. They just want the cabs to do the job for as little money as possible and, as part of that, they want as much money for the City out of the industry as can be gotten. And, too, the industry must be overused as a convenient form of welfare. The truth is, too, that the City’s system of industry governance is back before the Revolution of 1837: we are taxed to death under the guise of licensing fees and we have no effective say in how the industry is run. And that’s all just peachy as far as most Toronto City Councillors are concerned. Last month, in Part One of this series, I began the tale of how and why the City of Toronto has long since turned its taxi industry into a money-making, money-saving device for itself. During my 42 years as a driver, a taxi industry that once provided an arguably reasonable means of earning a hard dollar has been changed by the City’s political-bureaucratic system into an outright cash cow for the City itself – and this, at great cost to the industry’s property holders and its working drivers. The reader will understand that all City taxi drivers – no matter their arrangement in the business – must operate as businessmen. Costs rarely, if ever, go down. Thus the dollar value of each of the three massive cuts in incoming revenues that I described in Part I of this series – the City’s non-reaction to the Airport Exemption of 1978, its issuance of 500 additional plates added to a pre-existing 2,480 taxis in 1982, and the issuance of yet another 500 plates in 1987 – came right out of every driver’s daily profits. All of these cuts are still with us – the exemption and the oversupply of cabs hugely stunting every driver’s incoming revenues every shift they work. Times were good in the 1980s such that the effects on driver income of these large share-outs of the daily fare pool were less apparent than they might otherwise have been, though the 1987 issuance of 500 plates, even in good economic circumstances, was clearly a serious overload of the system. But then came the fall of 1989, when interest rates suddenly rose again to 12 1/2 percent and taxi fares soon disappeared like the buffalo of the Western plains. The bad years of 1990 to 1994 – the leanest ever – followed. At the lowest ebb, three nights out of seven, it was impossible for a driver to make costs. The rest of the week it was a crap shoot. 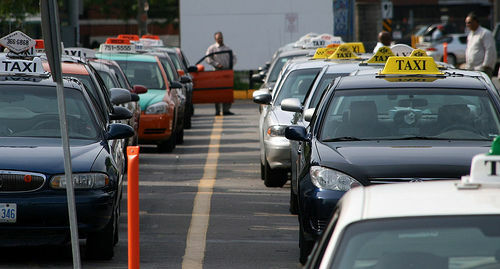 After expenses, a cabbie might go home with $25 or $60 or $130 – usually for 12 hours hard slogging. There were few “good nights” for four or five years. And there were all the attendant problems. Because the driver was taking in very little, vehicle upkeep suffered and it became difficult, then impossible, to replace worn-out cabs. Drivers couldn’t support their families on taxi earnings. Many got into rackets, selling bootleg cigarettes, bootleg liquor, dope and perhaps even women. Many cabbies of long experience forced themselves to look for other work, to be replaced in the taxi business by even larger numbers of new immigrants, some of whom brought ways of doing things into the business that won’t work here but that they would not easily let go of. The worst shift I remember was a Thursday night two weeks before Christmas in 1991 when, amidst hundreds of angry cabbies, I covered the downtown streets for 12 hours and all I could take in was $59, while my costs were over $100. Two months after that I was gone from Toronto and the taxi business until November 1995. When I came back, the industry was changed. Gone were most of the old-time drivers I had known. They had been replaced by even more Third World immigrants who, being more used to deprivation, were at least initially somewhat more easy for the City to exploit. But, too, a lot of these soon joined a union and wanted change. And there was a “union friendly” City Councillor who was more then ready to help them out. Howard Moscoe’s father and uncle had both been career taxi drivers. And, as they say, In the Land of the Blind the One-Eyed Man is King. Next Month – Part Three: All About Howie and His Big Idea! Peter McSherry is the author of three published books, one of which is Mean Streets: Confessions of a Nighttime Taxi Driver. “To all my readers – I wish to thank Leroy St. Germaine and Your Ward News for their interest in publishing a story with a message that seemingly no other publication in Toronto, except for Taxinews, would publish.” -P. McSherry.